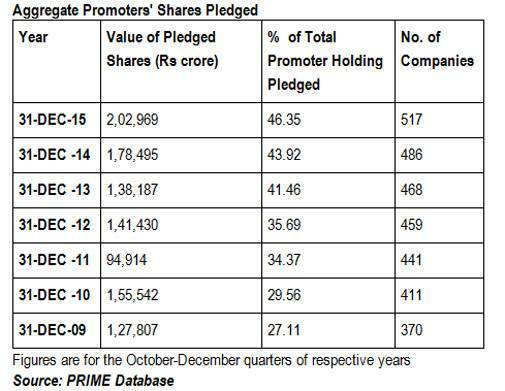 Shares pledged by promoters in NSE-listed companies hit a seven-year high in December 2015, according to PRIME Database. Shares pledged by promoters in NSE-listed companies hit a seven-year high in December 2015, according to PRIME Database. Promoter share pledging saw an increase of 14 per cent in the third quarter (October-December) of fiscal year 2015/16, with the value of pledged shares going up to Rs 2.03 lakh crore, compared to Rs 1.78 lakh crore in the corresponding quarter of 2014/15. "Given the fall in equity markets, this points to a high level of financial distress," Pranav Haldea, Managing Director, PRIME Database, noted in a release issued to the media. In percentage terms, too, promoters' pledged shares have gone up to 46.35 per cent in Q3FY16 from 43.92 per cent in the corresponding quarter last year. Out of 1,506 NSE-listed companies, around 517 companies had pledged shares, up from 370 companies six years ago. Moreover, during this six-year period, the percentage of total promoter pledged share holdings have gone up dramatically from about 27 per cent to 46 per cent. Notes Haldea: "High pledge levels are typically not considered a good sign by the investors as a downturn in the market price can lead to invocation and change in management." Surprisingly, there were as many as 25 companies in which the complete holding (100 per cent) of the promoters was pledged. They were AGC Networks, Ankit Metal & Power, Bajaj Hindusthan Sugar, DQ Entertainment (International), and Eastern Silk Industries, among others. Overall, there were as many as 79 companies in which more than 90 per cent of the promoter shareholding was pledged and 208 companies in which more than 50 per cent of the promoter shareholding was pledged. 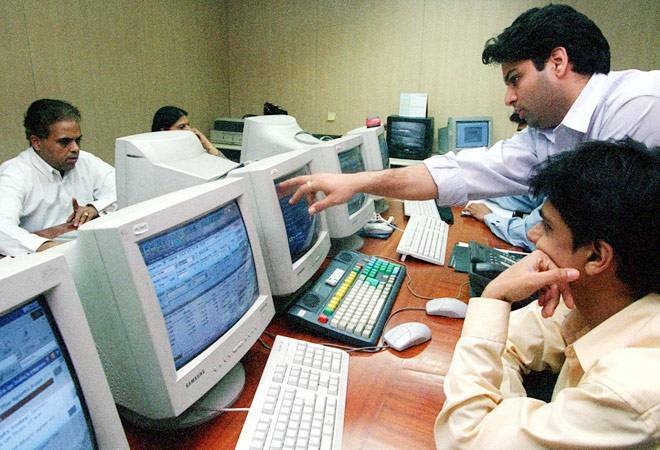 There were nine companies in which pledged shares were brought down to zero during this period: Mangalam Cement, Mangalam Timber Products, Century Enka, Astec Lifesciences, Sanghvi Movers, Jay Shree Tea & Industries, Essel Propack, Blue Star and Vaibhav Global. Overall, there were 78 companies in which the percentage of promoter holding decreased in this period. The largest pledge creation transaction in this quarter was that of S.B. Adani Family Trust, promoter of Adani Ports & Special Economic Zone, pledging 7.60 crore shares on October 13, 2015 to IDBI Trusteeship Services, the value of the pledged shares being Rs 2,459 crore. In all, shares of promoters of as many as 19 companies were invoked in the September and December 2015 quarters. The company in which the maximum value of shares was invoked during the quarter was Pipavav Defence & Offshore Engineering (Rs 300 crore).